Stamps > My Favorite Things Clear Stamps "Sassy Pants Holidays"
Maybe traditional or sentimental isn?t really your style. 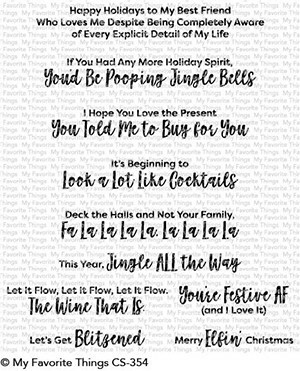 Or, perhaps you like to mix it up by incorporating some unexpected greetings into your holiday repertoire something for those friends that love the holidays but in a slightly saucy style. Sassy Pants Holiday is your solution. This sentiment set features an attractive font mix a fun script paired with a clean and simple sans serif to amplify your message in the best possible way. Jingle ALL the Way this season with this irresistible collection. Clear stamp sets include the name of the set on the sticker for easy identification. Our clear stamps and Die-namics are made in the USA.